Back when Nikon first introduced the D7000 two and a half years ago, the only real competition in its midrange DSLR class was from Canon. In fact, the D7000 carved out a new spot in the Nikon DSLR lineup between the D90 and the D300s to compete directly with the Canon EOS 60D. The new Nikon D7100 (priced at $1,200) takes the D7000’s place as Nikon’s flagship APS-C sensor camera, but enters a market that has a lot more contenders. Besides the Canon EOS 60D, which has since dropped in price to $900, recent DSLRs that compete directly with the D7100 include the Sony SLT Alpha 77 ($1,100) and the Pentax K-5 II and K-5 IIs ($1,100 and $1,200, respectively). Like the Pentax K-5 IIs (and big brother Nikon D800E), the Nikon D7100 eschews an anti-aliasing filter – or optical low pass filter (OLPF) – to gain sharpness. Though this enables photographers to achieve higher resolution and clarity for detailed images, you may end up with increased moiré effects when shooting subjects with patterns (read more about anti-aliasing filters here). In addition to removing the anti-aliasing filter from the sensor, the D7100 bumps resolution up from the D7000’s 16.2 megapixels to 24.1 megapixels. The new camera also sports an improved autofocus system with 51 AF points (15 cross-type), in comparison to the D7000’s 39-point (9 cross-type) AF system. Other improvements include a larger and higher-resolution LCD (3.2-inch 1,229K dots in the D7100 vs. 3.0-inch 921K-dot model in the D7000), a new viewfinder that utilizes a high-contrast OLED display, and improved HD video recording capabilities (1080/30p or at 60i/50i in 1.3x crop mode). Support for an optional WiFi adapter for easy wireless file transfer and remote control (with a supported smartphone or tablet) also sets this camera apart. 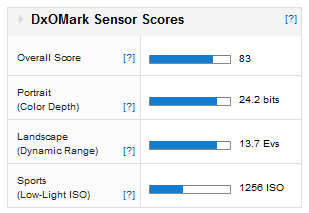 With an Overall Score of 83, the D7100 ranks well among its fellow semi-professional DSLRs, and achieves the second best score among all APS-C sensors tested in our labs. The only APS-C based camera to score better is the Nikon D5200, which scored a negligible one point higher (amounting to a difference of less than 1/15 of a stop). 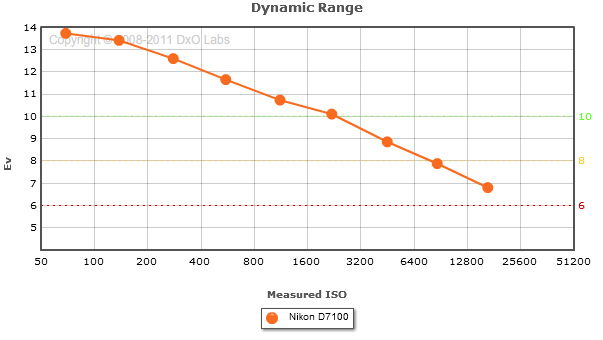 In fact, the D7100 scored very closely to the D5200 across the board. Interestingly, the D7100 has the same resolution sensor as the lower-end D5200 (which sells for $800), but the D5200’s sensor does include the anti-aliasing filter. 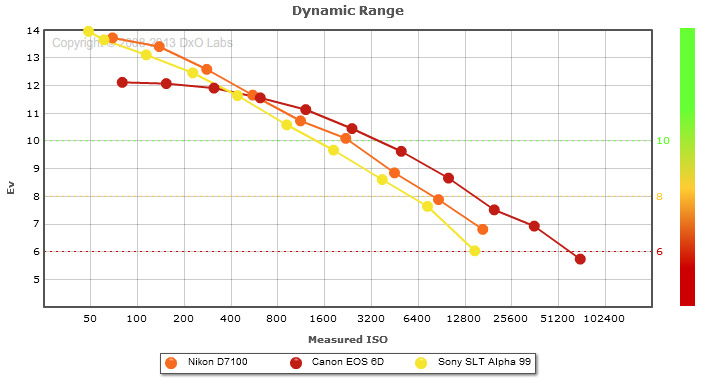 The D7100 achieved good marks for dynamic range, with a Landscape Score of 13.7 Evs. 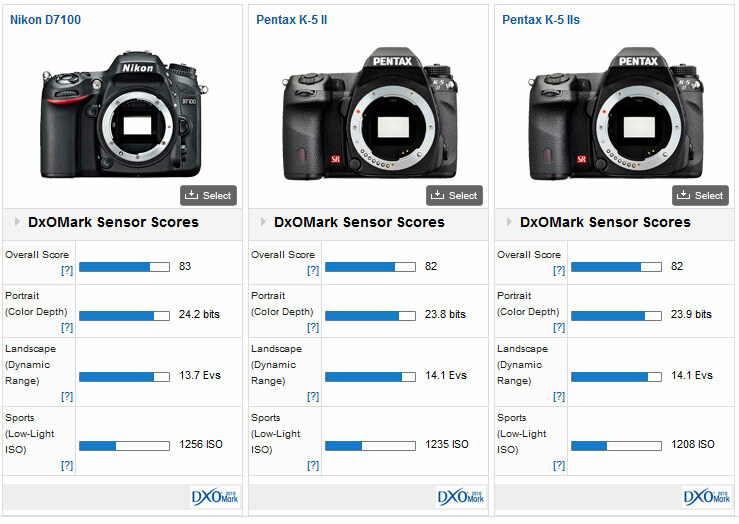 While it came in behind other APS-C sensors, such as those in the Pentax K5, K5 II, and K5 II S (as well as a touch behind the Nikon D5200 and D7000), the score differences were minimal enough that they wouldn’t likely be discernible. 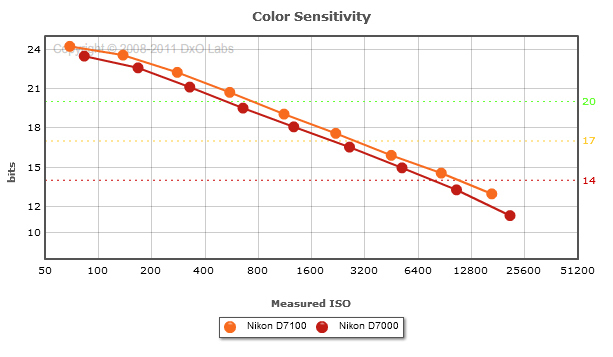 As with other Nikon/Sony sensors, the dynamic range score is especially high for the low ISO settings, indicating that the D7100 should be able to handle high light contrasted scenes well. 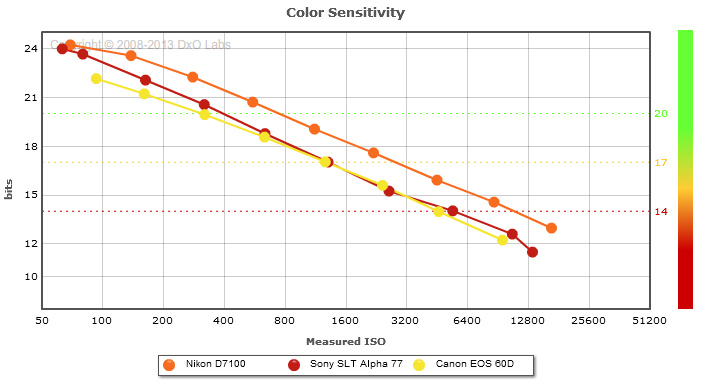 The D7100’s color depth performance was also at the top among APS-C sensors, with a Portrait score of 24.2 bits. In fact, for both dynamic range and color depth, the D7100 scored only slightly lower than semi-pro full-frame cameras such as the Nikon D600 and Sony SLT Alpha 99 and even higher than the full-frame Canon 6D. The camera didn’t fare quite as well on low-light ISO tests. While it did top the charts among APS-C camera sensors on the Sports Score at 1256 ISO, that score is low compared to full-frame semi-pro cameras such as the Canon EOS 6D or Nikon D600. 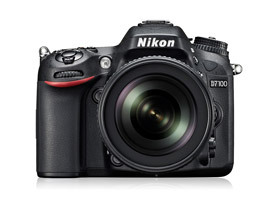 Though the Nikon D7100 does improve on the D7000 with a higher-resolution sensor (minus the OLPF) and features such as its larger LCD, new and improved AF system, and better HD movie recording modes, when it comes to image quality, the difference between the two cameras turns out to be quite small. Anyone considering the Nikon D7100 is likely to have two other APS-C sensored semi-pro DSLRs on his or her shortlist: the Sony SLT Alpha 77 ($1,100) and the venerable Canon EOS 60D ($900). Both cameras are beginning to get a little long in the tooth, however: The 60D came out just shortly before the D7000 about two and a half years ago, and the Alpha 77 just about a year after that. So while both sport APS-C-sized CMOS sensors (18 megapixels for the 60D and 24.3 for the Alpha 77), the D7100 has a more advanced AF system that offers 51 focus points (vs. 19 in the Sony and nine in the Canon) and supports features such as Nikon’s optional WiFI adapter, whereas the Canon and Sony cameras must rely on the third-party EyeFi device for connectivity. The D7100 also has a larger and higher resolution LCD, though it’s fixed while the 3-inch models from Canon and Sony are fully articulated. And while the Sony can match the Nikon’s ISO sensitivity range of 100 to 25600 (in enhanced mode) and even go as low as ISO 50 (enhanced), the Canon offers only ISO 100 to 12800 (enhanced). The Sony and Nikon also offer better HD video recording modes than the Canon. Another key difference among the cameras is continuous shooting speed. The 60D’s is the slowest at 5.3 fps, whereas the D7100 delivers speeds of 6 fps, but the Sony Alpha 77 benefits from its SLT (Single Lens Translucent) technology’s stationary mirror, which enables a whopping 12 fps. The D7100 will set you back $100 to $300 more than the Sony and Canon respectively, but when it comes to image quality, there’s no contest—the D7100 beats both cameras hands down. 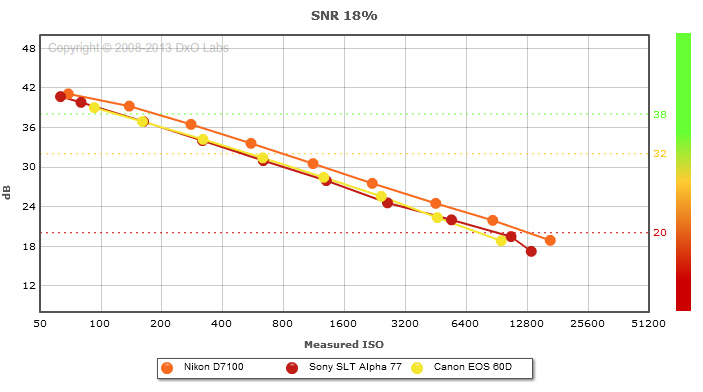 Taking a look at the SNR 18 % comparison, the D7100 scored about 2/3 of a stop better than the other two cameras for the whole ISO latitude (as can be seen in the chart below), which indicates that the camera will be capable of producing images with less noise across all ISO levels, enabling better low-light and sports photography. The Nikon was able to register a Sports Score of 1256 ISO, whereas the Canon (which offers a narrower ISO sensitivity range than the other two cameras) scored 813 ISO. The Sony, which provides the broadest ISO range, was only able to score 801 ISO, due to the limitations of its SLT technology, which diverts some light away from the sensor (read more about the A77’s SLT technology here). The Nikon also delivers in terms of portrait shooting, besting the 60D and Alpha 77 by more than 1 full stop across the full ISO sensitivity range. While the Portrait Scores for the Nikon and Sony were close at 24.2 bits and 24 bits (Sony benefits from the broader enhanced ISO range), and the Canon scores lower at 22.2 bits, you can see from the color sensitivity measurements below that even at the highest ISO settings, the Nikon should be able to produce greater nuance in colors than both of the other two cameras. Landscape shooters would do well to take notice of the big difference between the dynamic range scores of these cameras. 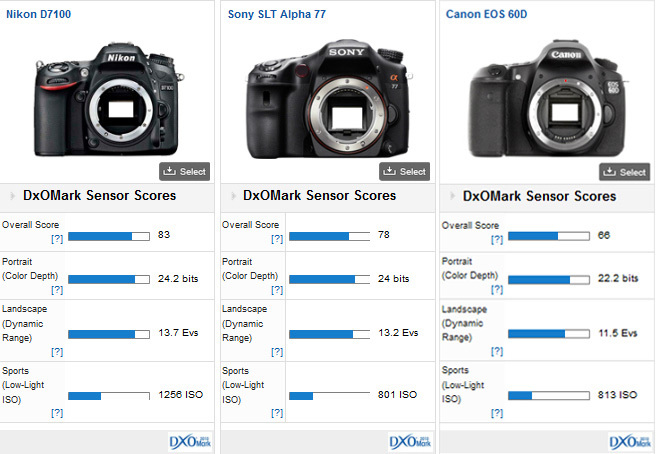 The D7100 scored 13.72 Evs while the Sony Alpha 77 scored a discernible 0.57 Evs lower and the Canon 60D scored a full 2.22 Evs lower at 11.5 Evs. 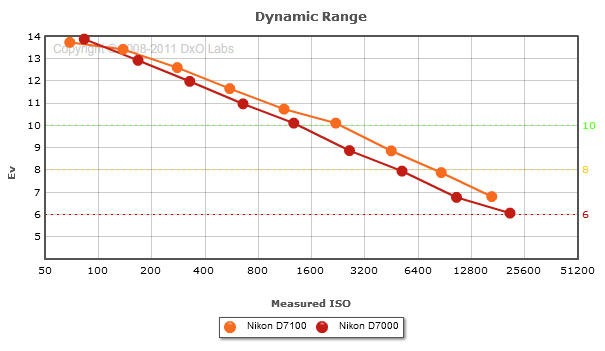 Looking at the dynamic range measurements below, you can see that the Nikon was able to perform between 1 and 1.5 stops better than the competition across the full ISO range. A closer competitor to the Nikon D7100 is the Pentax K-5 IIs, which similarly removes the anti-aliasing filter from its sensor, as well as its near identical twin, the Pentax K-5 II (which retains the filter). Although the K-5 II and K-5 IIs, which are priced at $1,100 and $1,200 respectively, both include APS-C-sized sensors like the D7100, Pentax opted to use lower-resolution 16.3-megapixel units. Other feature differences between the Pentax models (which are identical save for the anti-aliasing filter) and the D7100 include a broader ISO range of 100 to 51200 for the Pentax cameras, fewer autofocus points with 11 (vs. 51 in the Nikon), smaller and lower resolution LCDs (3-inch, 921K dots vs. 3.2-inch, 1,229K dots on the Nikon), faster continuous shooting mode (7 fps vs. 6 fps for the Nikon), and lower frame rates for HD video recording (e.g., 1080/25p vs. 1080/30p or 60i/50i for the Nikon). 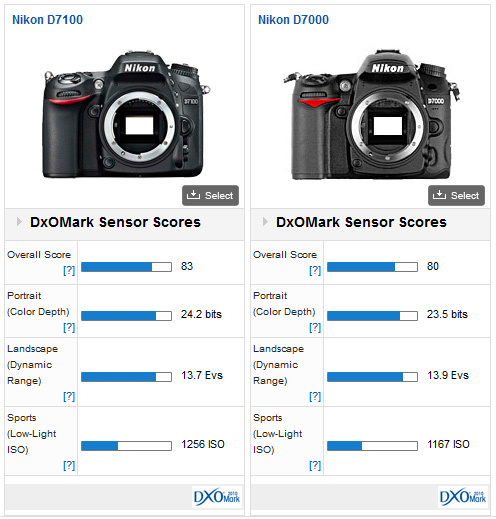 When it comes to performance on DxOMark tests, however, the Nikon D7100 scored essentially the same as the two Pentax models. While it’s clear that the Nikon D7100 sits at the top of the charts compared with other APS-C-based semipro DSLRs, we also compared it with semi-pros that sport full-frame sensors, such as the Canon EOS 6D ($2,100) and the Sony SLT Alpha 99 ($2,800) to see how it fared against these higher tier competitors. 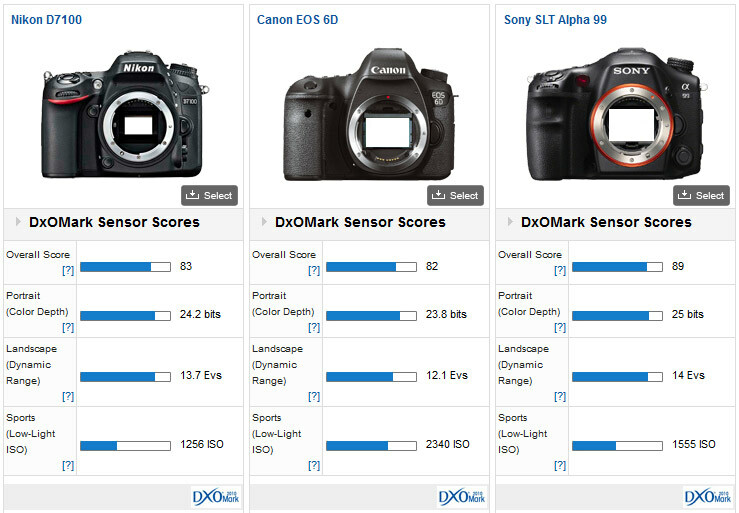 With an equivalent Overall Score on the DxOMark as the Canon 6D, and competitive marks across use case scores with both higher-end cameras, the Nikon holds its own in terms of image quality. The main advantage of a full-frame sensor should be seen in low-light shooting, and indeed the Canon scored well above the Nikon’s 1256 ISO at 2340 ISO. The Sony, which clearly takes a hit on low-light performance due to its SLT technology, achieved an only slightly higher score than the Nikon, but at 1555 ISO, the difference is likely indiscernible. The other interesting score is the Landscape Score, where the Sony scored highest at 14 Evs and the Nikon as a close second at 13.7 Evs. The Canon, on the other hand, trailed both significantly at 12.1 Evs. 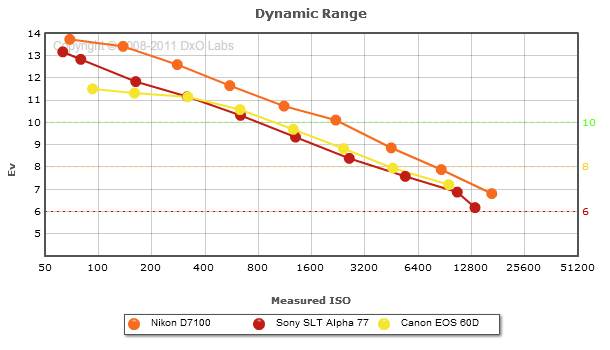 It’s worth noting, that the Nikon and Sony have very high measured dynamic range for low ISOs, but the Canon actually achieved better measurements at high ISO settings. The new Nikon D7100 is a worthy replacement for the D7000, maintaining its reputation for superior image quality among APS-C-based DSLRs. With an impressive new feature set and the ability to deliver better sharpness and resolution due to the elimination of the anti-aliasing filter from its 24.1-megapixel CMOS sensor, the D7100 takes over as Nikon’s flagship APS-C DSLR. Not only does it maintain Nikon’s position at the top of the APS-C performance charts, but it also gives full-frame competitors a run for their money, delivering similar image quality results for $1,000 less.